9 inch x 12 inch for sale sign. 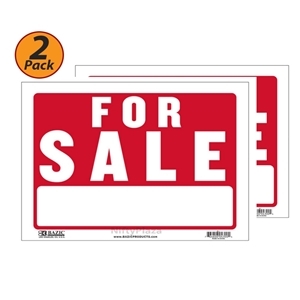 States "For Sale" in white and has a red backing. Bazic For Sale Sign’s simple design helps draw the attention you need. At 9” x 12”, there is enough room to let buyers know what you have to offer. This For Sale sign attracts buyers and helps you get noticed. With bright red and room to add descriptions, we make it easy for you to sell.